Segregation and isolation practices for dealing with leprosy varied from country to country, but from the 1890s, and following on the first international Leprosy Conference, in Berlin, in 1898, resolutions on the isolation and segregation of leprosy sufferers became the dominant public health measure. Leprosy institutions also varied widely in character from country to country and in the degree of compulsion exerted on those who were segregated. Once people with the disease were confined, the segregation of the sexes, control of sexual activity, and the problem of what to do with children born within the institutions produced solutions such as forcible sterilization and abortion, early removal of babies from their mothers, the establishment of orphanages, adoption, and the training of children to become nursing attendants and paramedical workers. Only now are researchers uncovering the continuing impacts of leprosy on families. Policy was interconnected even in extremely diverse locations, and by implication reveals the extent of the international communication amongst those who worked in the field throughout the decades. This interconnectedness is reflected in the international leprosy conferences and congresses that took place in 1898, 1906, 1923, 1948, and thereafter, every five years. 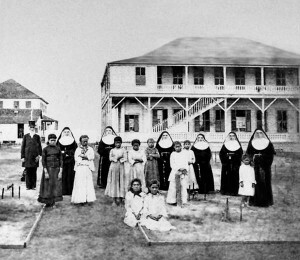 In the earliest colonies for example, in Hawaii and Surinam, both plantation economies, while at first healthy children were tolerated in leprosy asylums, in time, and under external expert communications and advice, children born to leprosy-affected parents were separated from their parents and housed and educated apart from the general population. In Hawaii, children with leprosy were taken from their parents and sent to Kalaupapa. Uninfected children born on Kalaupapa either continued to live and die there with their families, or faced removal to special homes in Honolulu. Eventually, compulsory removal of healthy children became enshrined in policy. At the same time, healthy children also voluntarily accompanied family members to Kalaupapa as mea kokua (carers) and lived out their lives in isolation. Up until the reorganisation of leprosy asylums in the 1890s, healthy children were permitted to live with their parents in the asylums, but, at about the same time as the changes brought about by the Leprosy Mission, in India, in the 1890s, children were subsequently segregated into special quarters. Then in 1931, in concert with international developments, a special school for children with leprosy was founded. The Mission to Lepers, in offering shelter to people with leprosy in India, was forced to face conflicting moral imperatives to do with men and women cohabiting and producing children in their leprosy asylums. They became particularly concerned with the child born in these circumstances, showing no signs of the disease, but representing a threat of infection, impossible to determine and equally impossible to underestimate. At this point, the idea of the “untainted child” became current, and saving children from leprosy became a worthy and rewarding task in religious and economic, as well as in medical terms. This practice of separating uninfected children into orphanages under missionary management in the nineteenth century also occurred in some African countries. In colonial Uganda in the early twentieth century, men, women, and children were segregated in different settlements, with varying degrees of success and trauma. The large colony of Culion, in the Philippines, which had been established in 1906, was by this time facing an overwhelming problem of numerous uninfected children being born to leprosy-infected people. Catholic nuns were given responsibility for caring for the young women and for nursing people with medical complications. 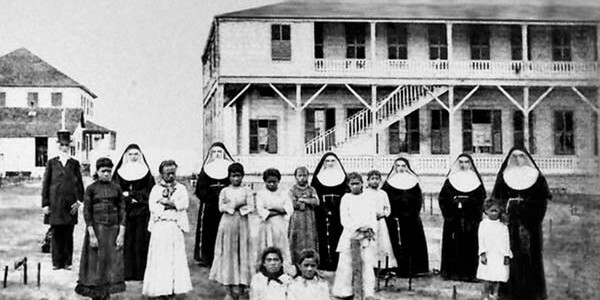 The nuns and administrators made great efforts to segregate men and women, but people resisted these efforts and the island increasingly became hyper-endemic for leprosy. Religious groups and also secular specialist organisations such as the British Empire Relief Association produced a chorus of concern about the presence of children in the colony. This problem was turned into an opportunity, with encouragement from the League of Nations, when medical observers focussed upon children in an effort to understand more about the transmission of the disease. At the same time, Brazil began a modernising project that resulted in constructing a national network of leprosaria on a grand scale. These institutions were accompanied by especially dedicated preventorio in which children born to leprosy-affected people were kept in orphanages. This project was then adopted in Portugal. The problem of what to do with children born to people with leprosy was only part of a larger problem and that was the problem of how to manage sexuality in institutions where people would be confined for life. When India achieved independence from the British, leprosy became emblematic of national reconstruction and the first All India Leprosy Workers’ Conference considered the problem of child leprosy in 1948 and with it the possibility of introducing voluntary sterilization, not as a eugenic measure, but as a means of protecting children from infection. In Japan, under new nationwide legislation, a national network of leprosaria were established, but in this case, these were accompanied by eugenic policies, in which people were encouraged to choose partners with the proviso that men be sterilised and the women, if they happened to fall pregnant, undergo abortion. Although the international medical community were assured that these procedures took place with the consent of the inmates, it would subsequently emerge that considerable institutional, social, and psychological pressure was brought to bear on those who wished to pursue anything resembling a normal life as a couple. In spite of these measures, many children still lived out their lives in sanatoria. The long-term impacts of these eugenic policies continued to play themselves out in the overwhelming psychological impact on survivors. Today, in Malaysia and in Brazil, many people are undergoing DNA testing in order to discover their family connections. The continuing impact of the policies to do with the untainted children of leprosy affected parents is still being played out, as people attempt to locate surviving family members. Researchers who are working in this new area are Anwei Skinsnes Law (Hawaii), Stephen Snelders (Surinam), Kathleen Vongsathorn (Uganda), Alice Cruz (Portugal and Brazil), Jane Buckingham (India and the Pacific), Waka Hirokawa (Japan), Kathryn M. Tanaka (Japan), Yukiko Araragi (Japan), Eeannee Tan (Malaysia), Lavinia Schuler Faccini (Brazil) and myself (India and the Philippines).